Q: How to define style when batch converting? I’ve tried the batch convert feature, that’s great! Just choose PDFs to convert and leave the rest to the software. But one thing is confusing, it seems no options to define flippingbook style in batch convert feature, does that means I can’t choose styles when batch converting flip books? No, you still can define styles when using batch feature. Just switch to “Style” tab and define a book template. And then when finished, turn back to “Add file” tab to batch convert, the output flippingbooks will in the template you had chosen. 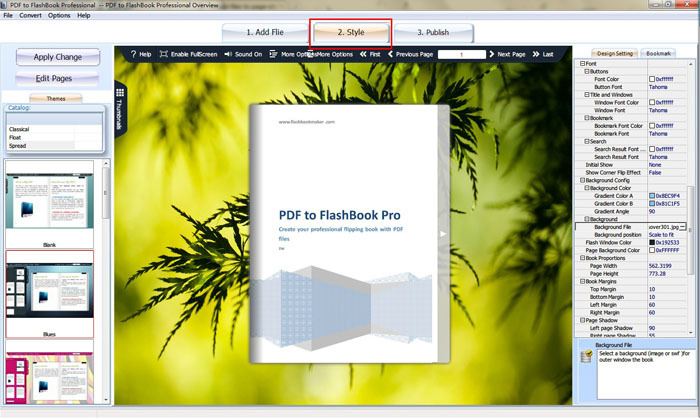 But please be aware that the template will apply to all of the output flash books. This means all books in the same template.